This is pretty much like watching Corbin Bersen’s home movies. That would be really awesome if you were a member of Corbin’s family, but for those of us looking for a serious treatment of the whole “low budget movie where a luxury spaceship liner gets hijacked” idea, we’re kind of screwed. Corbin gets to dress up in a silly looking outfit, chomp his cigars and spin around in office chairs while taking over or “spacejacking” the Star Princess. His real-life wife Amanda Pays is along for the ride as a good guy trying to help save the rest of the passengers. I found it odd that Corbin and Amanda didn’t have very many scenes together, but she probably got a look at him crawling around on the floor of the bridge imitating a sheep and began to have second thoughts about this whole “let’s make a movie together” scheme. The Star Princess is full up (with about 10 or so people) with billionaires who are on board for a trip to the moon. The ship has all the amenities any self-respecting sci-fi movie from Roger Corman’s Concorde-New Horizons would be expected to have. There’s ugly set design where everything high tech has a decidedly low tech look. (The communications system is basically just some closed circuit TVs). 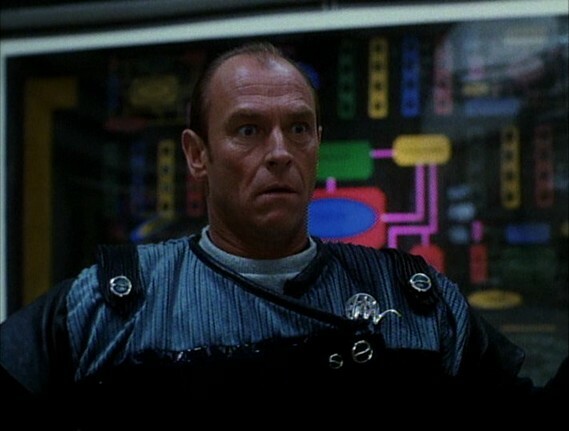 Corbin plays the Second Mate on board the ship and has a scheme so diabolical that an entirely new word has to be invented to describe his crime: Spacejack! It’s like hijack, but in space! Corbin is going to hold the rich dilettantes hostage until they give him access codes for their money. Once he gets the money, a guy in another spaceship will rendezvous with Corbin and aid his escape. Corbin is then going to use the money to set up a colony for him and the androids he builds! Because real people are super sucky! He executes the plan to perfection when the android he has reprogrammed to help him blows up way too much of the ship killing most of the people on board! We see several extras falling down and lots of junk falling in the corridors of the ship before things settle down. There’s still enough wealthy passengers left though to get him the money he needs, but more importantly there’s still the First Mate and Amanda to contend with! First Mate Taylor has the advantage of looking like Tom Wopat which reassures the audience that he is a sort of can-do fellow who’s not going to give up until every hairbrained last ditch plan is used and every air duct is crawled through! 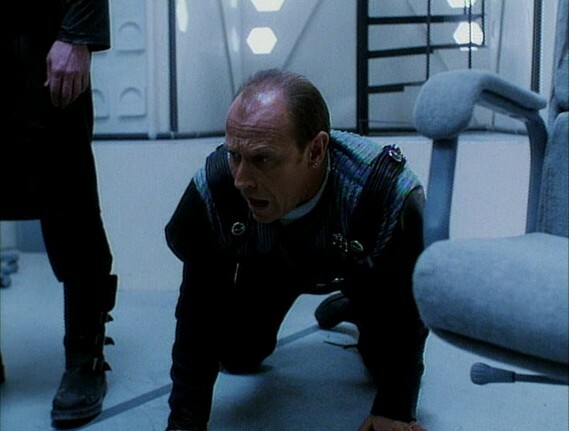 Do you need a guy who can get himself caught in an area of the ship that Corbin depressurizes so that he almost gets sucked out into space? Check! Is a dude that kicks Corbin in the nuts during a stilted fight scene where he stands around waiting for Corbin to hit him back something you’ve been craving? 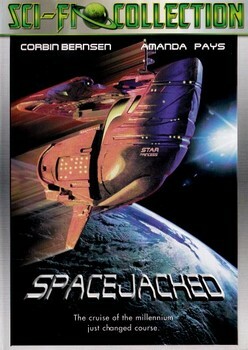 Spacejacked is just that jacked! Amanda is on board not because she is rich, but because she won a contest. She is an aficionado of luxury space liners though and knows all about them from flying simulated versions of them on her home computer! Somehow this prepares her to go out on a spacewalk where she and Taylor find some extra C-4 plastic explosive that didn’t detonate for some reason when Corbin’s android blew up the ship. And heck, that stuff is still good if you just stick a flare in it, light it up, and throw it in that android’s face! The movie is at its hideous best though when it is simultaneously trying to tell us what a genius Corbin is while showing us what nitwit he really is. 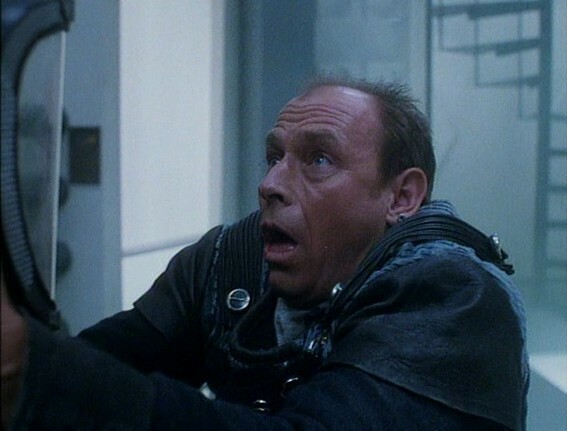 While we are supposed to believe that he somehow had access to and reprogrammed one of the ship’s androids, was able to get the ship loaded up with explosives, and arranged for a partner with a spaceship to be the getaway vehicle, he hadn’t planned at all on how to secure the ship from a guy climbing onto the bridge through the big air duct while his back was turned? Surely, after all the Die Hard clones where one man thwarts terrorists by climbing inside ventilation systems, any aspiring terrorist would address that issue first. As befits most of Roger Corman’s science fiction movies of the era, Spacejacked continues to recycle the worst of the clichés these movies usually traffic in. I speak of course of the dreaded “self-destruct countdown.” Why would a civilian passenger spaceship come equipped with a self-destruct ability? The self-destruct gimmick needs to be retired unless and until someone can convincingly explain why it’s necessary. Everything finishes up in expectedly anemic fashion when Taylor and Amanda are rescued after a passing spaceship spots a good android that Corbin had blown into space and the good android leads his rescuers back to the Star Princess. The only Spacejacking you will remember when this one finishes is the hour and fifteen minutes the Bernsen family spacejacks out of your life.